You’re probably thinking it’s taken me a long time to recover from our Forbes Solos Rally as it happened nearly 6 weeks ago, but truth is I have been enjoying my travels with some of the Solos since leaving there and blogging wasn’t on my mind. However, I’m now feeling guilty that I haven’t kept up to date so once again I’m playing catch up…..
Here’s where Forbes sits in the big Australian picture. 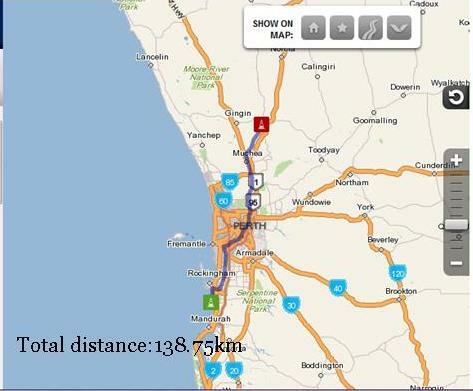 And where it is in relation to more local landmarks. 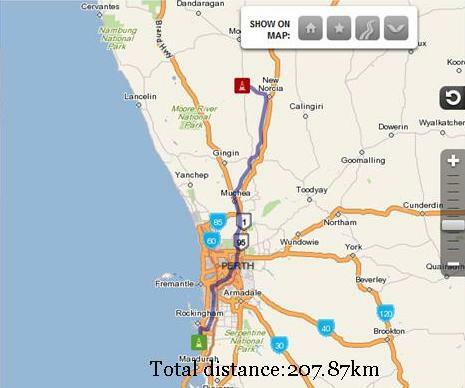 My last blog told of how hot the weather was and it certainly didn’t cool off for the first week or so in Forbes. The temperatures were consistently up in the mid-30 degrees Celsius which made for very hot days and uncomfortably warm nights. I was lucky to get a shady parking spot at the Rally Site which I was most grateful for. This was the biggest Solos Rally I had ever been to, and I think it is the biggest ever held. There were around 320 motorhomes including 72 First Timers. When we left Forbes and our shopping dockets had been added up, we had spent nearly $100,000 in town – a massive boost to the economy of this country town. This quick slide show is of a town tour we did that included an ‘art park’, some of the old buildings in town, our visit to the biscuit factory and then out to a local business, woolerina. …. Most of the activties though were back at the rally site, where Dave Applegate, the Rally Manager, and his intrepid team made sure we were on the go both day and night. Our traditional Pet Parade saw pet owners vying for prizes in lots of different categories, although I thought Phil’s cat needed a special mention for Bravery. Dr Phil’s travelling companion found a safe spot at the Pet Parade. Karin Kirk, in the purple, our Belly Dancing teacher. The Poet’s Breakfast saw a program of talented Solos both writing and reciting their poetry. We also had a local gent perform a poem on horseback..
Ros Edwards, what a clown! And of course, our Dinner Dance ….. the theme at this rally was to dress as something starting with “F”……. look what we all came up with …..
Forbes used to be known as a quiet country town famous as the final resting place of the notorious bushranger, Ben Hall. I think the 330 odd Solos that were welcomed to Forbes in March 2017 have left an indelible mark on this friendly town and they will be talking about us for a while to come….. perhaps not as long as Ben Hall but in a much more positive way! Categories: Australia, Camping, New South Wales, Rallies & Events, Travelling | Tags: campervans and motorhomes, camping, CMCA, Forbes, New South Wales, Solo travellers, Solos Network, Solos Rally, woolerina | Permalink. This was a familiar refrain at the CMCA, (Campervan and Motorhome Club of Australia), rally in Albany a couple of weeks ago! Despite the wet weather over 600 motorhomes and their occupants were there to enjoy themselves – and we did! Here’s a photo of the Rally Site posted to the CMCA Facebook page by a local photographer, Brad Harkup. As I was a ‘First Timer’ I entered the Rally on Friday, two days before most of the other attendees arrived. This gave us ‘newbies’ time to get to know the rally site, find out where things were, decide on what activities I wanted to participate in and set up camp. The following day most of the Solos entered the site and on the Sunday the program started with a Trivia Night in the big white tent you can see on the oval in the photo above. That’s all I really want to say about that – We did not perform well!! One of the activities I most enjoyed was a bus trip to see a couple of the aboriginal sites around Albany. First we went to the Fish Traps which have existed for over 6000 years. The National Trust has managed the Oyster Harbour Fish Traps since 1966 after they were threatened by development. It is thought the traps were once part of a Noongar camp site where people had gathered for at least 7,500 years. The fish traps are designed in the shape of a crescent and only visible at low tide. They were first recorded by English explorer Captain George Vancouver in 1791. They consist of eight weirs made from thousands of stones. The traps caught huge numbers of fish as the Kalgan River rose and fell. Our next stop was at Yorrl Park where long necked turtles are re-stablishing themselves and breeding in the nearby sand hills. It was interesting to note that the local schools were involved in the design of the interpretive signs, as they were for the fish trap signs above. 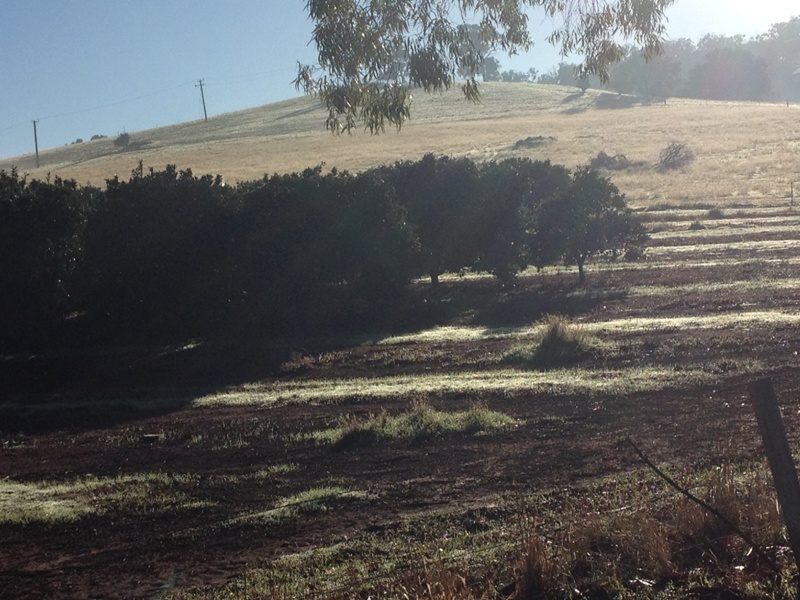 We finished out trip at The Old Strawberry Farm, the oldest farm in Western Australia. We didn’t have time to view the old home but harvested some lovely fresh herbs and vegetables from the community garden to take away with us. I thought it was rather special that the beautiful red poppies were flowering so close to Remembrance Day, 11th November. I also decided to do some craft activities, much to the horror of the instructors after they had seen how hopelessly ‘uncrafty’ I am. My first attempt was at making a card – well I blew that and ended up with a very tatty looking dolphin. I was given another one and all went well until I stuck it on the card and pressed hard to make it stick. All of a sudden my beautiful white dolphin had dirty fingermarks all over it! Here endeth my card making lesson! I did make a bracelet using a weaving method called Kumihimo even though it was a very individual pattern – not good at following instructions! And I also made a Christmas decoration using folded ribbons which looked fantastic until I turned it up the right way and all the ribbons escaped my pins! Oh well, perhaps I’ll stick to poetry! Every morning there was a Poet’s Breakfast and I was dedicated enough to front up each day at 7am to wait my turn to share a poem or two. Success at something at last! Saturday night at the Rally was a ‘Ball’. A great band played, lots of people dressed to the theme of ‘ a touch of military’ and generally we had a ball! Monday morning it was time to say goodbye to the Rally and Albany. I’m glad I’ve experienced a ‘big’ rally. I probably won’t rush to another one – perhaps Tassie in 2017 – but I’ve learned never to say never…. It’s time to have a break for a few days before I head to the Bridgetown Blues Festival. I’m certainly looking forward to that! 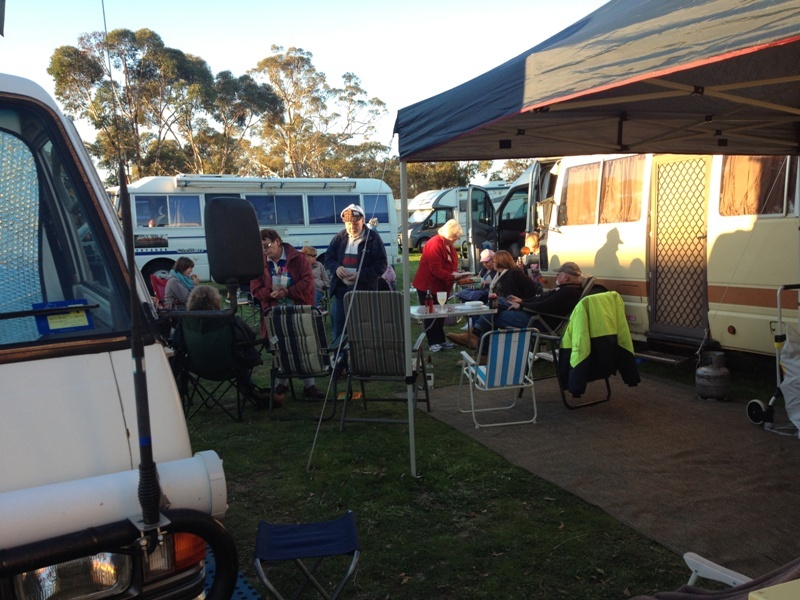 Categories: Australia, Camping, Rallies & Events, Travelling, Western Australia | Tags: Albany, Albany Rally, campervans and motorhomes, CMCA, CMCA Rally, Cranbrook, fish traps, Melbourne Cup Day 2015, rallies, Solos | Permalink. This poem is a variation of the poem I wrote to promote our Solo Travellers Rally in Wagin this year. It was presented on the last night to close the rally and promote our next rally in Forbes, NSW in March 2016. Have really done their best. Have coped with all the flakes! Some known, and then some new. So it’s sad when a rally ends. What the ‘grown ups’ have in store. To put on a fabulous show. Look out Forbes, we’re there to play! Categories: Australia, Poetry, Rallies & Events | Tags: bush poetry, CMCA, Forbes, motorhome rally, Solos Rally, Wagin | Permalink. And the beaches are the best. Has amazing things in store. And the red earth of the inland. To enjoy the starry nights. And you’ll never get rid of red dust. And not stuck to the tar. And we’ll see you in WA! 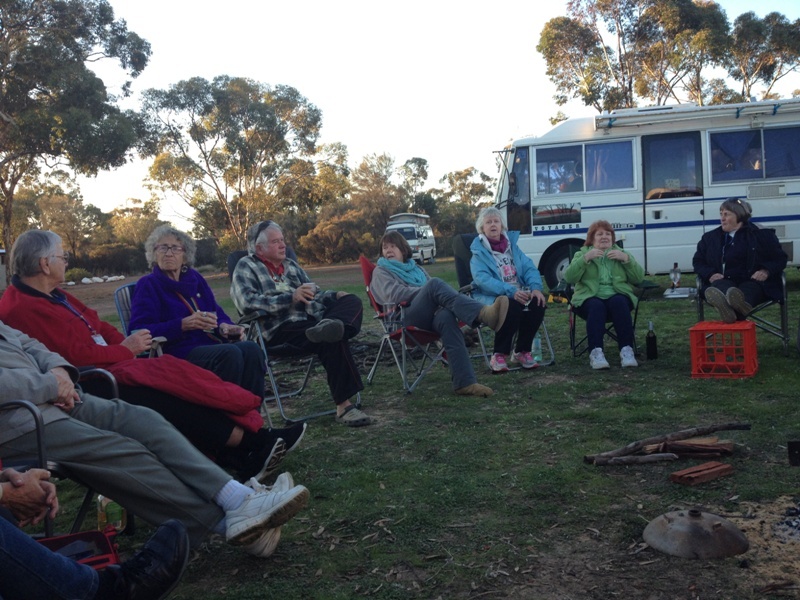 Categories: Australia, Camping, Poetry, Rallies & Events, Travelling | Tags: bush poetry, campervans and motorhomes, CMCA, poetry, Solos, Solos Rally, Wagin, Western Australia | Permalink. What a great catch up with many Solo friends I hadn’t seen for 12 months. Lots of HUGS all round! I have to say Penola wasn’t the most enjoyable rally I have ever been to, although that is no reflection on the rally organizers – more to do with the weather, which was cold and wet for most of the rally. This really stopped a lot of informal gatherings that normally happen and I found the cold weather a real shock to my system…. I’m definitely a sunshine and summertime girl! The program was stacked with things to do – line dancing, rock ‘n roll and ballroom dancing lessons plus trips to wineries and the Naracoorte caves. There were workshops for musicians, computers and photography and of course the traditional Poet’s Breakfast, where I told a couple of my poems. Our Big Night was themed red and white as Penola is in the famous Coonawarra wine growing area of South Australia. The final day of the rally was our Sports Day organized by Rainey and her band of helpers. The sun shone and it was a lot of fun, with the old fashioned egg and spoon races, tunnel ball and a three-legged race. The highlight, though, was the grape stomping competition. Handmaidens washed the feet of our grape stompers, Tony and John, and then they trod the wine and filled the bottles with grape juice as it poured from the barrels. A lot of fun – and a lot of energy expended by the stompers! Categories: Australia, Camping, Rallies & Events, Travelling | Tags: campervans and motorhomes, camping, CMCA, Penola, Solos Rally | Permalink. No – not those cute little chattering black and white birds, but the Western Willie Wagtails, a chapter of the CMCA. Mind you there was still a lot of chattering going on! My first trip was in May when we went to Bindoon. What a wet weekend it was! 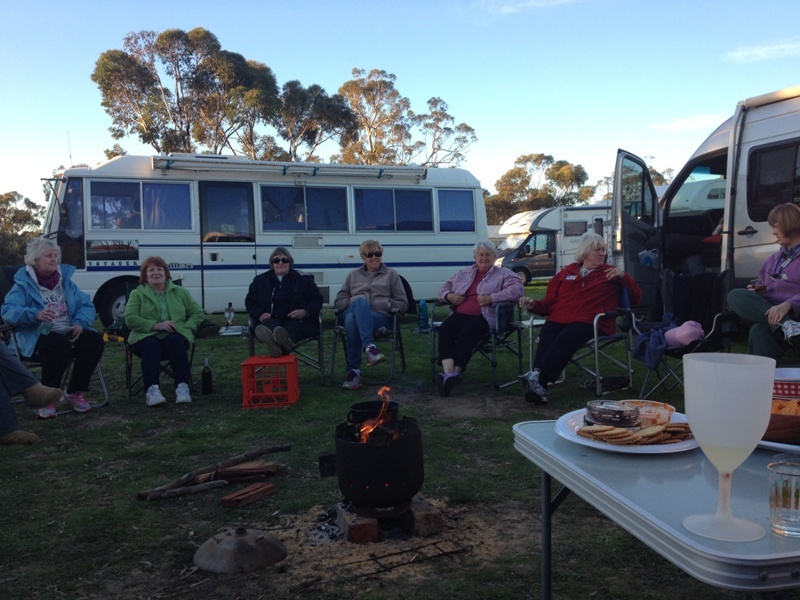 There were only a few vans camped at the Bindoon oval but it was a great opportunity for me to meet some new people. 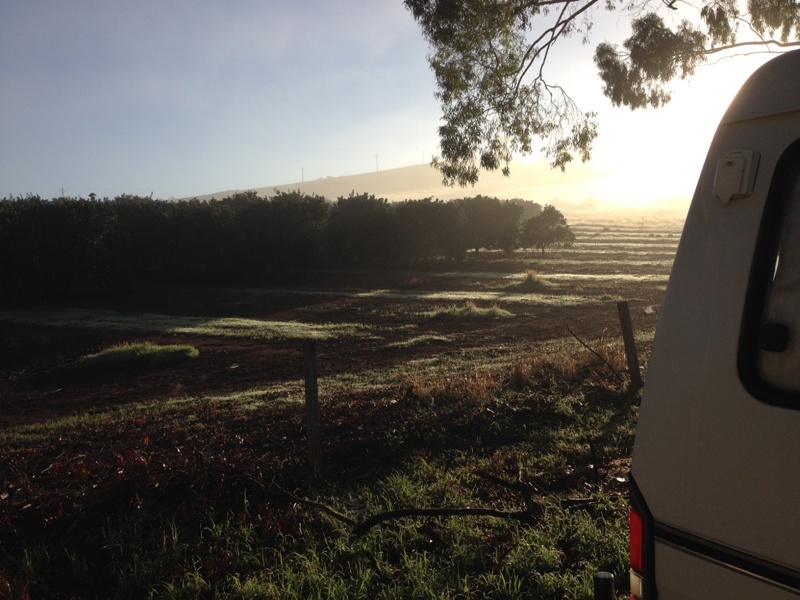 Richard, who I had met at Lucky Bay, also came along and his van became the meeting place as he put his awning out – it was the only reasonably dry area for us to gather. But as we discovered, if you sat to close to the edge the rain ran off the awning and down your back! As Happy Hour kicked in the awning struts also became a hazard as we forgot to duck whenever we moved so there was a constant cry of “Watch your head!” It didn’t do any of us much good as we still managed to knock our heads whenever we moved.Despite the weather we had a great time, and wandered off to the Bindoon bakery for morning tea together one day. When we woke on Sunday morning there was a heavy fog which was quite beautiful as the sun came up over the orange grove next to the oval. The stayers – well, we stayed! And there was a lot of noisy chatter. But we were all feeling fine. For me, the weekend was a winner! In June our venue was at Gillingarra. We travelled through Bindoon to get there and I had company on this journey as I picked up Wilma, one of the ladies I had met at Bindoon, to take her along. What a different weekend this was! There were about 20 vans at this excellent facility, with a great kitchen, hall, and hot showers. Although the weather was chilly it was dry, with beautiful sunny days and clear starry skies at night. 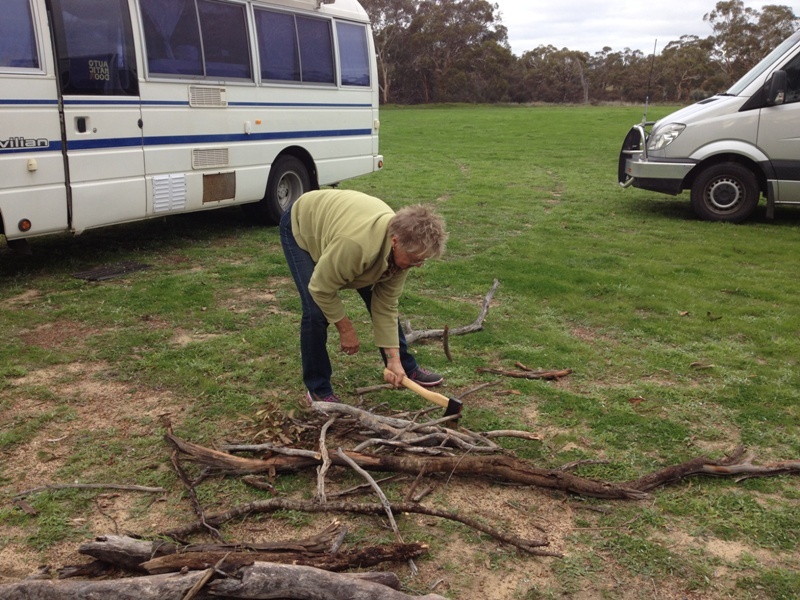 Jose(Yosay), who I had travelled with in Tasmania, turned up with her little campfire and we gathered around that on Thursday and Friday night for Happy Hour – and later!- and there was lots of good conversation and sing alongs led by Jose. Friday the 13th was also a full moon so we all stood up and wolf howled at the moon! I don’t think we would have scared anyone away with our feeble attempts, though! I was totally spoilt by Les, one of the other Solos, who cooked breakfast, lunch and dinner for both Wilma and I.
Saturday night was our shared meal in the comfort of the hall and then back out to the huge fire pit where Les had a massive fire going. The wind had dropped, the stars were out, the wine flowed, the company was excellent, the laughter loud – I can’t wait for the next meeting in July. Categories: Camping, Rallies & Events, Travelling | Tags: Bindoon, campervanning, camping, CMCA, Gillingarra, Solos, Western Australia, Western Willie Wagtails | Permalink.